Roberto Clemente is widely considered one of the greatest outfielders in MLB history and has long been a collector favorite. 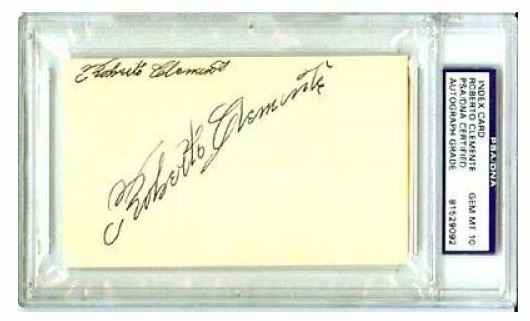 All vintage Roberto Clemente cards are highly coveted, particularly those in stellar condition. Even many of his newer cards continue to find an audience with collectors, especially those with memorabilia and cut signatures. The Hall of Famer's life and career were cut short following a tragic plane crash in 1972. Clemente was on his way to help earthquake victims in Nicaragua. Clemente finished his career with exactly 3,000 hits. He also helped lead the Pirates to a 1971 World Series win. Because of his untimely death, there are very little autographed materials available. 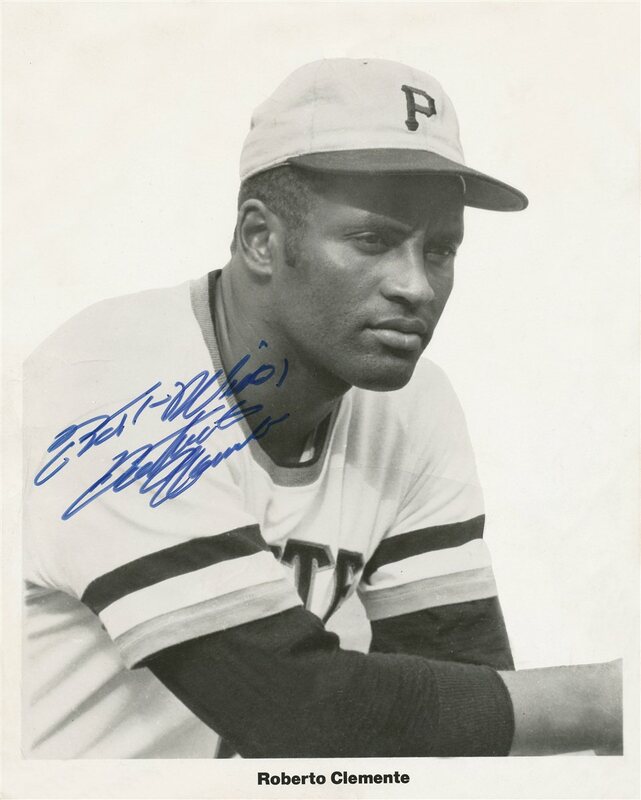 A native of Puerto Rico, Clemente was also known to be reluctant to sign autographs in his playing days. Like Sandy Koufax, Roberto Clemente's lone rookie card is in 1955 Topps Baseball. However, the Roberto Clemente card checks in at almost double the value of the Koufax. Despite not being true RCs, Clemente does have two other early options, including 1947-66 Exhibits #44 and 1947-66 PM10 Stadium Pins #33. Roberto Clemente's 1955 Topps rookie card is the clear-cut winner from the classic set. The horizontal card has a profile shot of Clemente. His smile comes across more like a grimace. The Roberto Clemente card also him in a hunched batting stance and a Pirates logo that does not seem to go with the design. Centering issues are a major problem for the card. Professionally graded copies in mint condition are extremely rare. 1968 Topps #150 Roberto Clemente Beckett 6.5 PSA? 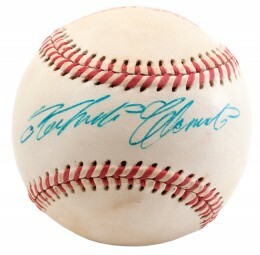 Below you will find an example of what Roberto Clemente's authentic signature looks like. This can be used as a first point of reference for determining the legitimacy of autograph memorabilia, but is not a substitute for having your items authenticated by a well-respected professional autograph authentication company. The signature is written with a well crafted elegance, in cursive with Latin influences. The first letter, "R" resembles something close to a "B", he would often sign "Bob" instead of "Roberto" - The "R" looks like a "3" woth a round oval at the bottom; two small circles to the left are very unique. The letters "o-b-e-r-t-0" are fluid; the "o" and "b" are both left slightly open. The pen lifts to start the "e" which is implied more than legible. The "r" is discernible, while the "t" is on crossed. The last "o" is unusually written high on the signing plane and very small. The "C" resembles what might also be mistaken as an "E" with two small loops and a trailing tail down and to the left. The pen lifts and draws the "l" as a straight line, albeit on an angle. The "e"'s in the last name are different, with the first resembling the second "r" in of his first name. The letters "m-e-n" are legible with the "e" being somewhat implied. The pen lifts again for another uncrossed "t" with a curlycue at the bottom and then a small dash line to finish the signature. I have 6 original Clemente cards I need to part with. They are as follows: 1957#76, 1958 #52, 1959 #478, 1969 #50, 1970 #350, 1973 #50. All are in good or better condition. What are the values of these cards? I would like to sell them ASAP. I have a 1969 NL batting champions card with Pete Rose, Roberto Clemente and Cleon Jones on the card. Rose and Clemente have signed the card. Is there any value to this card? I have a set of 4 glasses commemorating a special event in Roberto’s life. 12 All Star Games, 4 Times Batting Champ, 3000 Hits, 12 Gold Gloves on the back. 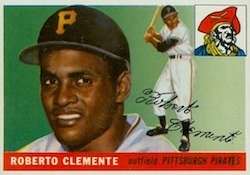 Different drawings of Clemente on the front.They were issued by Eat’n and Park a Pittsburgh diner. What might be the value of this set? My dad has a Clemente card/picture that he obtained at a game played at Forbes Field when he was a boy. It looks like the one listed above the text:(Roberto Clemente Cut Signature Pricing) on your web page. I believe he got his signature as well. What kind of value is it worth. We are huge Pirate fans and I don’t know where to get a estimated value. It will most likely be passed down to me, unless he run into a financial hardship. Thanks for the help. I do not agree that the two items you list in the article were actually distributed before his rookie card. Both of those issues are lumped into a group of cards that were issued between those years. Clemente’s photo used for his exhibit card wasn’t taken until 1960. It is the same image used for the 1961 team issue. It is more likely that those you have listed came out after 1960 and that fits in the group of years for those issues. Clemente hadn’t really come into his own as a good player until 1960 really. I have a Montreal Expos Game Magazine from an August 1971, Expos vs Pirates game. I was at the game and was 13 at the time. I obtained about 12 signatures of the players from the Expos and Pirates, incl; Ron Hunt, Nelson Briles, Boots Day, Bob Veale, Steve Blass, Milt May, Ron Woods, Jim Gosger, Claude Raymond, Ron Brand and Roberto Clemente. Unfortunately, all but 2 of the sigs were done in pencil and have faded somewhat, but because they are on an inner page in the book they are still clear and readable. Any idea of value?